Need an expert take on a hot topic? Meet our engineering & applied science experts. 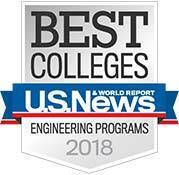 The Fred DeMatteis School of Engineering and Applied Science (SEAS) - ranked 35th by US News World Report - is home to Hofstra's computer science and engineering departments. The DeMatteis School is distinguished by offering students hands-on research experience in state-of-the-art laboratory facilities, valuable pre-professional, on-the-job experience, and collaborative relationships with professors who are leaders in their fields. In addition to coursework in engineering and computer science, students have the opportunity to participate in the DeMatteis Co-op Program, working as a full-time salaried employee for a company in a field related to their major. This, along with a strong foundation in the liberal arts and sciences, prepares DeMatteis students well – 98 percent of undergraduate degree recipients reported that they were employed, attending or planning to attend graduate school within one year of graduation (Class of 2015-16). The mission of the DeMatteis School is to educate engineers and computer scientists that are creative, entrepreneurial and ready to tackle critical global challenges.